This collection and linkage of media objects and texts is a reflection on the form and content of two database-driven new media documentaries, Public Secrets and Blood Sugar, which provide interactive interfaces to online audio archives of conversations recorded with incarcerated women and injection drug users. These are the first two works in a series designed to allow socio-economically marginalized individuals to testify to the social and economic injustices they experience in the context of a broad spectrum of public institutions – the criminal justice system, the prison industrial complex, the public health system, and the public education system. 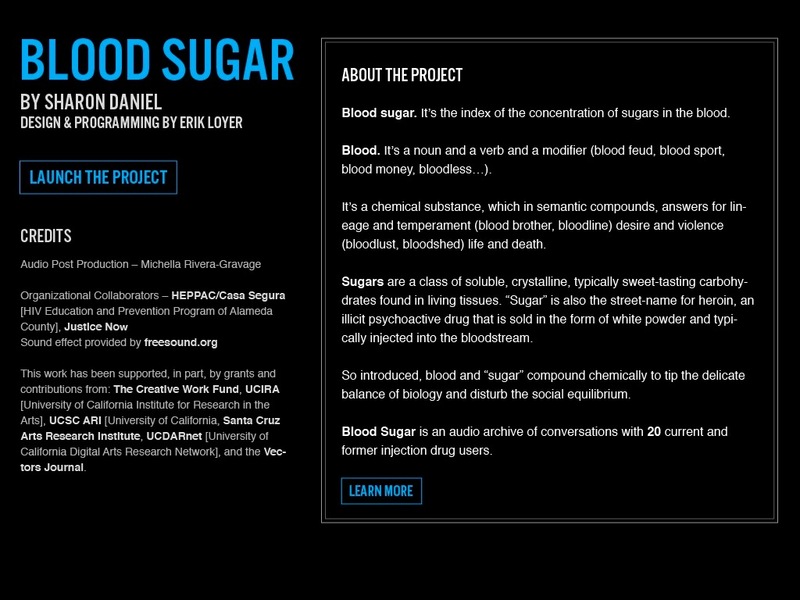 In this online publication Public Secrets and Blood Sugar serve as case-studies of how interface design constitutes a form of “argument,” (as writing does for a scholar), and user navigation functions as a form of “inquiry” (a distillation and translation of the research encounter of the Documentary-maker). Through anecdote, annotation, narration and analysis the author of these texts (and the original works they examine) considers the political potential of database documentary as well as the tensions and contradictions that emerge at the intersection of theory, aesthetics, advocacy and activism. Because the interfaces to Public Secrets and Blood Sugar were realized in Flash, it is not possible to link directly to specific screens, views or media within these sites. Therefore, I have included numerous screen shots and video screen grabs to illustrate the essay – and in some cases have copied texts that are part of these sites. These sites were designed for user interaction, and I hope readers will visit the actual sites and experience them directly. Discussion of "Argument, Inquiry and Political Narrative: Navigating an Aesthetics of Database Documentary"
Version 48 id 58445 of this page, updated 06 May 2014 by Alison Naturale. Created by Sharon Daniel.